865 Integrated Amplifier audio amplifier from Boulder Amplifiers, Inc.
Hi-Fi Amplifier > 865 Integrated Amplifier > Boulder Amplifiers, Inc.
Like all Boulder electronics, the 865 Integrated Amplifier began life as a challenge. High-performance sound has always meant separate components, numerous cables, and large space requirements. Convenient, integrated solutions, however, always fell short when it came to truly exceptional sound quality. When Boulder decided to build an integrated amplifier, we were determined to create a product that provided the convenience of a single-chassis design while still maintaining all of the performance and functionality of our legendary separate components. It would not be a product that accepted the limitations traditionally associated with integrated amplifiers, but instead would be a true performance-based solution for smaller systems or space limited installations. The 865 Integrated Amplifier was thus created to solidify the relationship between listener and music at a level of performance previously unheard of in an integrated amplifier. 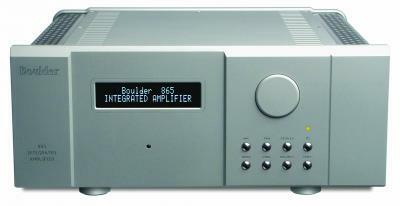 865 Integrated Amplifier > Boulder Amplifiers, Inc. Very impressive amplifier, both in build and sound quality. Clarity and distortion-free sound is what I most noticed about this amp - I was able to make out all kinds of subtly musical shadings normally glossed over with my present amp. Also, this amp has very impressive dynamics, bass weight and slam.